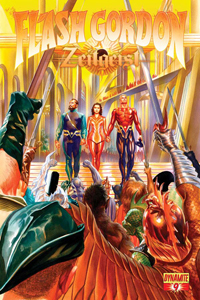 In Flash Gordon: Zeitgeist #9, things really start to change as far as the dynamic of the story goes. At this point, Ming is defeated and everyone on Mongo is at peace…or so we think. 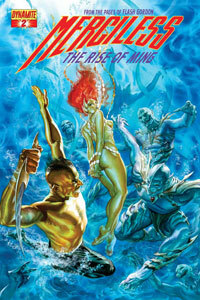 This issue is FULL of twists and turns and cliffhangers. 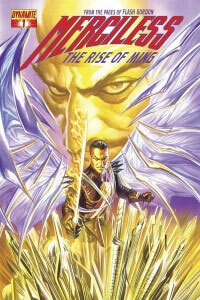 Just like a Flash Gordon comic should be. Eric Trautmann continues to do a fantastic job of keeping us on the edge of our seats. Just when we think that the next two issues of this series are going to have a nice, quiet wrap-up, he takes us on a WHOLE different adventure for Flash & company. This issue is mostly political in nature, but it’s not without its share of action scenes, which are pretty spectacular. 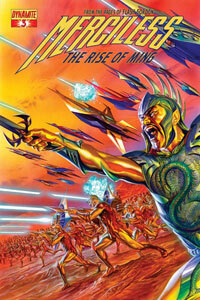 We also check back in with the Mongoan task force that’s fighting the war on Earth. All in all, things are kind of starting to wrap up, and this issue was a great penultimate chapter. VERY strange alliances are made, secrets are discovered, new events are set in motion, and you won’t believe who the new Emperor of Mongo turns out to be. All in all, an issue full of surprises and high adventure! 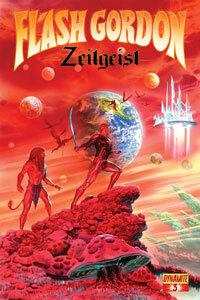 Reading Flash Gordon: Zeitgeist #3, I’m reminded why I love the character so much. It’s the ultimate fish out of water story, except the fish knows how to fight and has a sword and ray gun. Since both Eric Trautmann amd Alex Ross are credited with the story, I guess I have to praise them both for coming up with, really, what this book is supposed to be. Remember movies like Raiders of the Lost Ark or Back to the Future 2, when there was a cliffhanger almost every two minutes? Imagine that kind of story, in comic form, and that’s what you have here. Absolutely edge of your seat reading. New characters are introduced, there’s danger everywhere. THIS is why the phrase “page-turner” was coined.